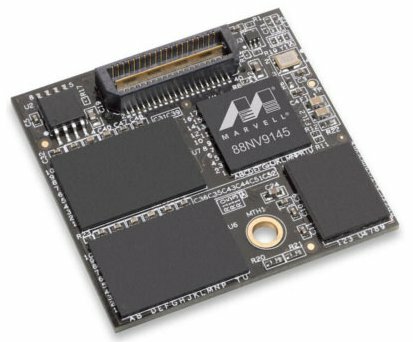 Marvell (Nasdaq: MRVL), a worldwide leader in integrated silicon solutions, today announced the Marvell® 88NV9145, the world’s first modularly scalable native PCIe SSD controller available in mass production. The 88NV9145 controller provides a core building block designed to create native PCIe SSDs in flexible configurations that incrementally scale in cost, capacity and performance. By combining a low-latency, non-blocking PCIe switch with two or more 88NV9145 components, customers can create flexible native PCIe SSD configurations for different market segments. Each Marvell 88NV9145 controller supports a PCIe 2.0 x1 interface, ARM-based processor, external Double Data Rate (DDR) interface and four NAND flash channels with up to four Chip Selects (CSs) per channel. In addition, each 88NV9145 can support up to 128GB NAND capacity and has been tested to achieve up to 93,000 4K random read IOPS and 70,000 4K random write IOPS.